Every year, my alma matter, Oregon State University, takes on our rivals, the University of Oregon in a grudge-match football game.Â Every college in the United States has a rivalry game, ours is called the “Civil War”. This year, the game was down in Eugene so we watched hosted a Civil War party for some close friends and family.Â But the big news of the night was that we had some beer sampling, provided by Pale Horse Brewing Company of Salem, Oregon, a brewery I’ve covered before. 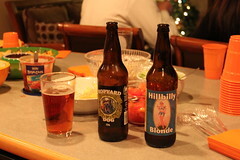 At our Civil War Party, we sampled three Pale Horse brews – Hillbilly Blonde Ale, Pale Horse Stout and the company’s newest offering, Hopyard Dog IPA. 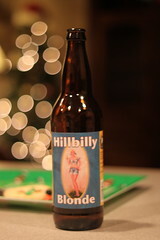 I’ve covered the Stout and Hillbilly Blonde brews before, so this post will mainly be about the IPA. The newest brew from Pale Horse, Hopyard Dog is a very well balanced IPA.Â The hop taste is noticible, but not overpowering.Â The bitterness gives a little bit of punch, but doesn’t stun or overwhelm you. With Hopyard, Dennis has formulated an IPA that, without a doubt, will become very popular.Â I know many folks who like IPA, but don’t like some of the stronger ones that Northwest brewers have to offer.Â Hopyard Dog fills a void by offering a bold yet very satisfying taste sans the bitter. A hearty thank you goes out to Pale Horse Brewing for providing us wonderful ales to sample at the Civil War Party.Â All three brews went off really well. If you’re in western Oregon, seek out Pale Horse’s beer.Â Their beer is featured in many fine taverns and ale houses, along with all Bi-Marts, Roths’s Markets, and many other retailers.